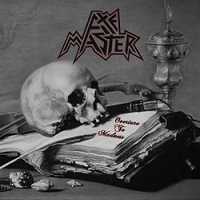 AXEMASTER is a Traditional Heavy Metal band Band from Ohio, United States and was formed in 1985 by lead guitarist Joe Sims and drummer Brian Henderson. The project and music has stood the test of time and remains strong after over 25 years. The band has released: "Slave to the Blade” (Demo in 1986), "Blessing in the Skies” (1987), "Crusades” (Single in 1987), "Metalgon” (Split in 1987), "The Vision” (Single in 1988), "Death Before Dishonor” (1990), "5 Demons (Imperative Is Their Demise)” (Demo in 1991), "1985-1995” (Split in 1999), "Death Before Dishonor” (Compilation in 2002). After 25 years the guys are back with a new album, “Overture To Madness”, which will be released on 6th March 2015 through Pure Steel Records. Their influences clearly range from BLACK SABBATH, HEAVEN AND HELL, DIO, METALLICA, SLAYER to SAXON, JUDAS PRIEST and IRON MAIDEN. The whole album is killer. First track “Sanity's Requiem” after the opener has the amazing Heavy Metal spirit of the 80's. Great guitars with JUDAS PRIEST influences and power are here listenable. In “Dream or Nightmare” melodic guitars with a breezy atmosphere creates a ballad style with more energetic vibes. Calmer climate & lower guitars in BLACK SABBATH style are in “Peeling Skin” which make it as a very interesting song connecting heaviness, strength & calmness too! Track “Forsaken” has inside Heavy Metal riffs & huge drums. Fantastic, pulpy guitar riffs, which I love, you can dig in the track “Crimson Haze” and powerful drums, fine Heavy Metal backing singing and the impressive work of the rhythmic section are in “Thirty Pieces of Silver”. Fine riffs with melody are in “Dark Souls”, with a truly underground kind of heaviness in “Chylde”, Traditional Heavy Metal you can feel in “Sinister” and SLAYER influences with Thrash elements is listenable in great “Ashes”. And in the last one “Epic” is fine changeable rate in rhythmic section, fabulous guitars and voice of singer in Heavy Metal climate. “Overture To Madness” is a totally great album! Here is aggressive, classical Heavy Metal meeting modern, bright and production at a high standard. In the work of AXEMASTER you can find Thrash influences with the rough, deeper vocals of the new, talented front man Geoff McGraw. Unbelievable power beats from every piece of sound. You have here amazing guitar solos, stronger guitar riffs, huge rhythmic section and new ideas. Listenable here is also comeback to the tradition of Underground Metal and Heavy Metal so surely every Metal lover will be fan of their sounds.